Where did WIP Wednesdays go? Well … they disappeared for a bit. Life caught up with me for a bit and had me down and out for a little while. After a 2 week blog hiatus, I came home to a computer who’s temperamental tantrums caused severe issues that took a week to fix (yipes!). As soon as my computer was fixed, my beloved dog, Daisy crossed over Rainbow Bridge. To this day my heart is still broken & aching from saying goodbye to her. It’s at times even difficult to work in my studio because she’s not there with me anymore. But … she was always so happy that I also know she’d want me to carry on! So … I’m doing just that. While my heart is healing, I’ve been working on more tutorials for Parker’s Club. Parker’s Club offer 2 PDF tutorials a month to subscribers for just a small fee. Get more information on how to join & what you get here. 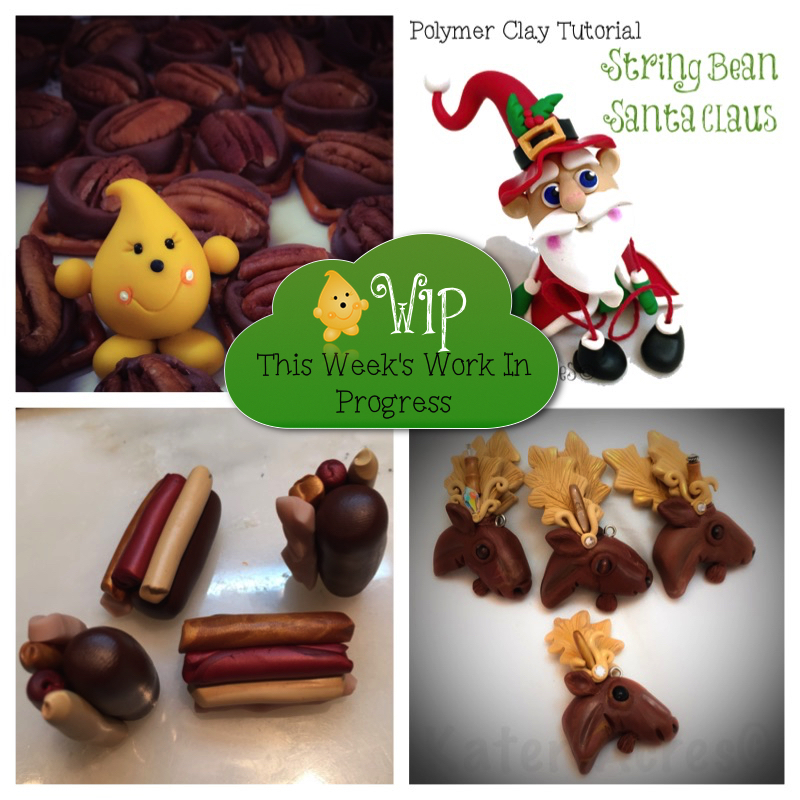 The most recent tutorial “String Bean Santa Claus” was delivered to members just this past week. Parker had a great week, including helping to make Rolo treats (one of his favorites) for Thanksgiving festivities. String Bean Santa and a few others were made in the studio this past week. You can get the tutorial here. Those colored portions of clay are what will become the bodies for the Moose you see on the right of this picture. The moose heads were made with Premo! brown, ecru, copper, & my secret ingredient. These Moose heads were made for a custom order. Every year this same lady orders Moose head ornaments for her friends. These were this years Moose-run. Get the tutorial to make a Moose head here. This week I am inspired by Lisa Ammerman, who has been a featured artist here on the blog. (Read her interview here). She’s been busy making the cutest handmade polymer clay art dolls in Santas, Snowmen, Snowballs, & Elves too. Each of her unique designs truly captures the fun, joy, & colors of the season. I received a wonderful surprise this Thanksgiving … my brother surprised me and came home for the holiday. It was so nice to see my brother! For the first time in 5 years, I didn’t spend ONE PENNY on Black Friday … not ONE penny. I also want to say how sorry I am about your sweet Daisy. I lost my Daisy in June, and I still am broken hearted over it. It will get better with time, but I sure miss her. I know exactly how you are feelings and my heart is with you. Hi Katie! Thank you so much for featuring my Santa, “a Bear and a Bundle”, here today. It’s always so nice to be recognized! I’ve had lots of fun making special Christmas characters this year. I hope your readers will drop into my etsy shop and have a look around. Or like my Facebook page, A Piece of Lisa. I am so sorry to hear Daisy crossed the rainbow bridge. Our two dogs Jacky and Charlie passed last year. I still miss them. My thoughts and prayers are with you.